"AZT" redirects here. For other uses, see AZT (disambiguation). 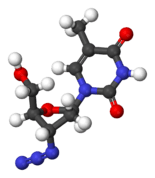 Zidovudine (ZDV), also known as azidothymidine (AZT), is an antiretroviral medication used to prevent and treat HIV/AIDS. It is generally recommended for use with other antiretroviral. It may be used to prevent mother to child spread during birth or after a needlestick injury or other potential exposure. It is sold both by itself and together as lamivudine/zidovudine and abacavir/lamivudine/zidovudine. It can be used by mouth or by slow injection into a vein. Common side effects include headaches, fever, and nausea. Serious side effects include liver problems, muscle damage, and high blood lactate levels. It is commonly used in pregnancy and appears to be safe for the baby. ZDV is of the nucleoside analog reverse-transcriptase inhibitor (NRTI) class. It works by inhibiting the enzyme reverse transcriptase that HIV uses to make DNA and therefore decreases replication of the virus. Zidovudine was first described in 1964. It was approved in the United States in 1986 and was the first treatment for HIV. It is on the World Health Organization's List of Essential Medicines, the most important medications needed in a basic health system. It is available as a generic medication. The wholesale cost in the developing world is 5.10 to 25.60 USD per month. As of 2015, the cost for a typical month of medication in the United States was more than 200 USD. AZT is usually dosed twice a day in combination with other antiretroviral therapies. This approach is referred to as Highly Active Antiretroviral Therapy (HAART) and is used to prevent the likelihood of HIV resistance. AZT has been used for post-exposure prophylaxis (PEP) in combination with another antiretroviral drug called lamivudine. Together they work to substantially reduce the risk of HIV infection following the first single exposure to the virus. More recently, AZT has been replaced by other antiretrovirals such as tenofovir to provide PEP. AZT is now a principal part of the clinical pathway for both pre-exposure prophylaxis and post-exposure treatment of mother-to-child transmission of HIV during pregnancy, labor, and delivery and has been proven to be integral to uninfected siblings' perinatal and neonatal development. Without AZT, as many as 10 to 15% of fetuses with HIV-infected mothers will themselves become infected. AZT has been shown to reduce this risk to as little as 8% when given in a three-part regimen post-conception, delivery, and six weeks post-delivery. Consistent and proactive precautionary measures, such as the rigorous use of antiretroviral medications, cesarean section, face masks, heavy-duty rubber gloves, clinically segregated disposable diapers, and avoidance of mouth contact will further reduce child-attendant transmission of HIV to as little as 1–2%. During 1994 to 1999, AZT was the primary form of prevention of mother-to-child HIV transmission. AZT prophylaxis prevented more than 1000 parental and infant deaths from AIDS in the United States. In the US at this time, the accepted standard of care for HIV-positive mothers was known as the 076 regimen and involved 5 daily doses of AZT from the second trimester onwards, as well as AZT intravenously administered during labour. As this treatment was lengthy and expensive, it was deemed unfeasible in the global south, where mother-to-child transmission was a significant problem. A number of studies were initiated in the late 1990s that sought to test the efficacy of a shorter, simpler regimen for use in ‘resource-poor’ countries. This AZT short course was an inferior standard of care and would have been considered malpractice if trialed in the US; however, it was nonetheless a treatment that would improve the care and survival of impoverished subjects. Early long-term higher-dose therapy with AZT was initially associated with side effects that sometimes limited therapy, including anemia, neutropenia, hepatotoxicity, cardiomyopathy, and myopathy. All of these conditions were generally found to be reversible upon reduction of AZT dosages. They have been attributed to several possible causes, including transient depletion of mitochondrial DNA, sensitivity of the γ-DNA polymerase in some cell mitochondria, the depletion of thymidine triphosphate, oxidative stress, reduction of intracellular L-carnitine or apoptosis of the muscle cells. Anemia due to AZT was successfully treated using erythropoetin to stimulate red blood cell production. Drugs that inhibit hepatic glucuronidation, such as indomethacin, nordazepam, acetylsalicylic acid (aspirin) and trimethoprim decreased the elimination rate and increased the therapeutic strength of the medication. Today, side-effects are much less common with the use of lower doses of AZT. According to IARC, there is sufficient evidence in experimental animals for the carcinogenicity of zidovudine; it is possibly carcinogenic to humans (Group 2B). Even at the highest doses that can be tolerated in patients, AZT is not potent enough to prevent all HIV replication and may only slow the replication of the virus and progression of the disease. Prolonged AZT treatment can lead to HIV developing resistance to AZT by mutation of its reverse transcriptase. To slow the development of resistance, physicians generally recommend that AZT be given in combination with another reverse transcriptase inhibitor and an antiretroviral from another group, such as a protease inhibitor, non-nucleoside reverse transcriptase inhibitor, or integrase inhibitor; this type of therapy is known as HAART (Highly Active Anti Retroviral Therapy). AZT is a thymidine analogue. AZT works by selectively inhibiting HIV's reverse transcriptase, the enzyme that the virus uses to make a DNA copy of its RNA. Reverse transcription is necessary for production of HIV's double-stranded DNA, which would be subsequently integrated into the genetic material of the infected cell (where it is called a provirus). Cellular enzymes convert AZT into the effective 5'-triphosphate form. Studies have shown that the termination of HIV's forming DNA chains is the specific factor in the inhibitory effect. At very high doses, AZT's triphosphate form may also inhibit DNA polymerase used by human cells to undergo cell division, but regardless of dosage AZT has an approximately 100-fold greater affinity for HIV's reverse transcriptase. The selectivity has been proven to be due to the cell's ability to quickly repair its own DNA chain if it is broken by AZT during its formation, whereas the HIV virus lacks that ability. Thus AZT inhibits HIV replication without affecting the function of uninfected cells. At sufficiently high dosages, AZT begins to inhibit the cellular DNA polymerase used by mitochondria to replicate, accounting for its potentially toxic but reversible effects on cardiac and skeletal muscles, causing myositis. Jerome Horwitz of the Barbara Ann Karmanos Cancer Institute and Wayne State University School of Medicine first synthesized AZT in 1964 under a US National Institutes of Health (NIH) grant. Development was shelved after it proved biologically inert in mice. In 1974, Wolfram Ostertag of the Max Planck Institute for Experimental Medicine in Göttingen, Germany reported that AZT specifically targeted Friend virus (strain of murine leukemia virus). Azidothymidine was first synthesized at the Michigan Cancer foundation in 1964 as part of a program directed toward the discovery of anticancer drugs. It gave negative results and attracted little further interest. In 1974, Wofram Ostertag at the Max Planck Institute demonstrated the ability of AZT to inhibit the replication of the Friend leukemia virus in cell culture. This report attracted little interest from other researchers as the Friend leukemia virus is a retrovirus, and at the time, there were no known human diseases caused by retroviruses. In 1983 researchers at the Institut Pasteur in Paris identified the retrovirus now known as the Human Immunodeficiency Virus (HIV) as the cause of acquired immunodeficiency syndrome (AIDS) in humans. Shortly thereafter, Samuel Broder, Hiroaki Mitsuya, and Robert Yarchoan of the United States National Cancer Institute (NCI) initiated a program to develop therapies for HIV/AIDS. Using a line of CD4+ T cells that they had made, they developed an assay to screen drugs for their ability to protect CD4+ T cells from being killed by HIV. In order to expedite the process of discovering a drug, the NCI researchers actively sought collaborations with pharmaceutical companies having access to libraries of compounds with potential antiviral activity. This assay could simultaneously test both the anti-HIV effect of the compounds and their toxicity against infected T cells. In June 1984, Burroughs-Wellcome virologist Marty St. Clair set up a program to discover drugs with the potential to inhibit HIV replication. Burroughs-Wellcome had expertise in nucleoside analogs and viral diseases, led by researchers including Gertrude Elion, David Barry, Paul (Chip) McGuirt Jr., Philip Furman, Martha St. Clair, Janet Rideout, Sandra Lehrman and others. Their research efforts were focused in part on the viral enzyme reverse transcriptase. Reverse transcriptase is an enzyme that retroviruses, including HIV, utilize to replicate themselves. Secondary testing was performed in mouse cells infected with the retroviruses Friend virus or Harvey sarcoma virus, as the Wellcome group did not have a viable in-house HIV antiviral assay in place at that time, and these other retroviruses were believed to represent reasonable surrogates. AZT proved to be a remarkably potent inhibitor of both Friend virus and Harvey sarcoma virus, and a search of the company's records showed that it had demonstrated low toxicity when tested for its antibacterial activity in rats many years earlier. Based in part on these results, AZT was selected by nucleoside chemist Janet Rideout as one of 11 compounds to send to the NCI for testing in that organization's HIV antiviral assay. In February 1985, the NCI scientists found that AZT had potent efficacy in vitro. Several months later, a phase 1 clinical trial of AZT at the NCI was initiated at the NCI and Duke University,. In doing this Phase I trial, they built on their experience in doing an earlier trial, with suramin, another drug that had shown effective anti-HIV activity in the laboratory. This initial trial of AZT proved that the drug could be safely administered to patients with HIV, that it increased their CD4 counts, restored T cell immunity as measured by skin testing, and that it showed strong evidence of clinical effectiveness, such as inducing weight gain in AIDS patients. It also showed that levels of AZT that worked in vitro could be injected into patients in serum and suppository form, and that the drug penetrated deeply only into infected brains. A rigorous double-blind, placebo-controlled randomized trial of AZT was subsequently conducted by Burroughs-Wellcome and proved that AZT safely prolongs the lives of people with HIV. Burroughs-Wellcome filed for a patent for AZT in 1985. The Anti-Infective Advisory Committee to United States Food and Drug Administration (FDA) voted ten to one to recommend the approval of AZT. The FDA approved the drug (via the then-new FDA accelerated approval system) for use against HIV, AIDS, and AIDS Related Complex (ARC, a now-obsolete medical term for pre-AIDS illness) on March 20, 1987. The time between the first demonstration that AZT was active against HIV in the laboratory and its approval was 25 months, the shortest period of drug development in recent history. AZT was subsequently approved unanimously for infants and children in 1990. AZT was initially administered in somewhat higher dosages than today, typically 400 mg every four hours, day and night. The paucity of alternatives for treating HIV/AIDS at that time unambiguously affirmed the health risk/benefit ratio, with inevitable slow, disfiguring, and painful death from HIV outweighing the drug's side-effect of transient anemia and malaise. In 1991, the advocacy group Public Citizen filed a lawsuit claiming that the patents were invalid. Subsequently, Barr Laboratories and Novopharm Ltd. also challenged the patent, in part based on the assertion that NCI scientists Samuel Broder, Hiroaki Mitsuya, and Robert Yarchoan should have been named as inventors, and those two companies applied to the FDA to sell AZT as a generic drug. In response, Burroughs Wellcome Co. filed a lawsuit against the two companies. The United States Court of Appeals for the Federal Circuit ruled in 1992 in favor of Burroughs Wellcome, ruling that even though they had never tested it against HIV, they had conceived of it working before they sent it to the NCI scientists. This suit was appealed up to the Supreme Court of the US, but in 1996 they declined to formally review it. The case, Burroughs Wellcome Co. v. Barr Laboratories, was a landmark in US law of inventorship. In 2002, another lawsuit was filed challenging the patent by the AIDS Healthcare Foundation, which also filed an antitrust case against GSK as well. The patent case was dismissed in 2003 and AHF filed a new case challenging the patent. GSK's patents on AZT expired in 2005 and in September 2005 the FDA approved three generic versions. ↑ "Zidovudine". PubChem Public Chemical Database. NCBI. Retrieved 2011-04-10. 1 2 3 "Zidovudine". The American Society of Health-System Pharmacists. Retrieved 28 November 2016. ↑ Fischer, Janos; Ganellin, C. Robin (2006). Analogue-based Drug Discovery. John Wiley & Sons. p. 505. ISBN 9783527607495. ↑ "Zidovudine". International Drug Price Indicator Guide. Retrieved 28 November 2016. ↑ Hamilton, Richart (2015). Tarascon Pocket Pharmacopoeia 2015 Deluxe Lab-Coat Edition. Jones & Bartlett Learning. p. 67. ISBN 9781284057560. ↑ De Clercq E (1994). "HIV resistance to reverse transcriptase inhibitors". Biochem Pharmacol. 47 (2): 155–69. doi:10.1016/0006-2952(94)90001-9. PMID 7508227. ↑ Yarchoan R, Mitsuya H, Broder S (1988). "AIDS therapies". Sci Am. 259 (4): 110–9. doi:10.1038/scientificamerican1088-110. PMID 3072667. ↑ "Updated U.S. Public Health Service Guidelines for the Management of Occupational Exposures to HIV". Retrieved 2006-03-29. ↑ "UK guideline for the use of post-exposure prophylaxis for HIV following sexual exposure (2011)". Retrieved 2014-04-07. ↑ "Recommendations for Use of Antiretroviral Drugs in Pregnant HIV-1-Infected Women for Maternal Health" (PDF). Retrieved 2006-03-29. ↑ Connor E, Sperling R, Gelber R, Kiselev P, Scott G, O'Sullivan M, VanDyke R, Bey M, Shearer W, Jacobson R (1994). "Reduction of maternal-infant transmission of human immunodeficiency virus type 1 with zidovudine treatment. Pediatric AIDS Clinical Trials Group Protocol 076 Study Group". N Engl J Med. 331 (18): 1173–80. doi:10.1056/NEJM199411033311801. PMID 7935654. ↑ Walensky RP, Paltiel AD, Losina E, et al. (July 2006). "The survival benefits of AIDS treatment in the United States". J. Infect. Dis. 194 (1): 11–9. doi:10.1086/505147. PMID 16741877. ↑ Morris, K (Feb 1998). "Short course of AZT halves HIV-1 perinatal transmission". Lancet. 351 (9103): 651. doi:10.1016/S0140-6736(05)78436-1. PMID 9500334. 1 2 Crane, Johanna (2010). "Adverse events and placebo effects: African scientists, HIV, and ethics in the 'global health sciences'". Social studies of science. 40 (6): 843–870. doi:10.1177/0306312710371145. ↑ "zidovudine, Retrovir". Medicinenet.com. 2010-08-12. Retrieved 2010-12-14. ↑ Sun, R.; Eriksson, S.; Wang, L. (2010). "Identification and Characterization of Mitochondrial Factors Modulating Thymidine Kinase 2 Activity". Nucleosides, Nucleotides and Nucleic Acids. 29 (4–6): 382–385. doi:10.1080/15257771003741018. PMID 20544523. ↑ Scruggs, E. R.; Dirks Naylor, A. J. (2008). "Mechanisms of zidovudine-induced mitochondrial toxicity and myopathy" (pdf). Pharmacology. 82 (2): 83–88. doi:10.1159/000134943. PMID 18504416. ↑ Fisher, J. W. (1997). "Erythropoietin: physiologic and pharmacologic aspects". Proceedings of the Society for Experimental Biology and Medicine. Society for Experimental Biology and Medicine. 216 (3): 358–369. doi:10.3181/00379727-216-44183. PMID 9402140. ↑ Fisher, J. W. (2003). "Erythropoietin: physiology and pharmacology update". Experimental biology and medicine (Maywood, N.J.). 228 (1): 1–14. PMID 12524467. ↑ "ZIDOVUDINE (AZT) – ORAL (Retrovir) side effects, medical uses, and drug interactions". MedicineNet. Retrieved 2006-01-09. ↑ "Summary of Data Reported and Evaluation". 2000. Retrieved 11 August 2012. ↑ Richman, D. (1990). "Susceptibility to nucleoside analogues of zidovudine-resistant isolates of human immunodeficiency virus". The American Journal of Medicine. 88 (5B): 8S–10S. doi:10.1016/0002-9343(90)90414-9. PMID 2186629. ↑ Wainberg, M. A.; Brenner, B. G.; Turner, D. (2005). "Changing Patterns in the Selection of Viral Mutations among Patients Receiving Nucleoside and Nucleotide Drug Combinations Directed against Human Immunodeficiency Virus Type 1 Reverse Transcriptase". Antimicrobial Agents and Chemotherapy. 49 (5): 1671–1678. doi:10.1128/AAC.49.5.1671-1678.2005. PMC 1087622 . PMID 15855480. 1 2 3 4 Mitsuya H, Weinhold K, Furman P, St Clair M, Li, Lars, Lehrman S, Gallo R, Bolognesi D, Barry D, Broder S (1985). "3'-Azido-3'-deoxythymidine (BW A509U): an antiviral agent that inhibits the infectivity and cytopathic effect of human T-lymphotropic virus type III/lymphadenopathy-associated virus in vitro". Proc Natl Acad Sci USA. 82 (20): 7096–100. Bibcode:1985PNAS...82.7096M. doi:10.1073/pnas.82.20.7096. PMC 391317 . PMID 2413459. 1 2 Yarchoan R, Klecker R, Weinhold K, Markham P, Lyerly H, Durack D, Gelmann E, Lehrman S, Blum R, Barry D (1986). "Administration of 3'-azido-3'-deoxythymidine, an inhibitor of HTLV-III/LAV replication, to patients with AIDS or AIDS-related complex". Lancet. 1 (8481): 575–80. doi:10.1016/S0140-6736(86)92808-4. PMID 2869302. ↑ Mitsuya H, Yarchoan R, Broder S (1990). "Molecular targets for AIDS therapy". Science. 249 (4976): 1533–44. Bibcode:1990Sci...249.1533M. doi:10.1126/science.1699273. PMID 1699273. ↑ Quan Y, Rong L, Liang C, Wainberg MA. Reverse Transcriptase Inhibitors Can Selectively Block the Synthesis of Differently Sized Viral DNA Transcripts in Cells Acutely Infected with Human Immunodeficiency Virus Type 1. Journal of Virology. 1999;73(8):6700-6707. ↑ Furman P, Fyfe J, St Clair M, Weinhold K, Rideout J, Freeman G, Lehrman S, Bolognesi D, Broder S, Mitsuya H (1986). "Phosphorylation of 3'-azido-3'-deoxythymidine and selective interaction of the 5'-triphosphate with human immunodeficiency virus reverse transcriptase". Proc Natl Acad Sci USA. 83 (21): 8333–7. Bibcode:1986PNAS...83.8333F. doi:10.1073/pnas.83.21.8333. PMC 386922 . PMID 2430286. 1 2 Yarchoan R, Mitsuya H, Myers C, Broder S (1989). "Clinical pharmacology of 3'-azido-2',3'-dideoxythymidine (zidovudine) and related dideoxynucleosides". N Engl J Med. 321 (11): 726–38. doi:10.1056/NEJM198909143211106. PMID 2671731. ↑ Collins M, Sondel N, Cesar D, Hellerstein M (2004). "Effect of nucleoside reverse transcriptase inhibitors on mitochondrial DNA synthesis in rats and humans". J Acquir Immune Defic Syndr. 37 (1): 1132–9. doi:10.1097/01.qai.0000131585.77530.64. PMID 15319672. ↑ Parker W, White E, Shaddix S, Ross L, Buckheit R, Germany J, Secrist J, Vince R, Shannon W (1991). "Mechanism of inhibition of human immunodeficiency virus type 1 reverse transcriptase and human DNA polymerases alpha, beta, and gamma by the 5'-triphosphates of carbovir, 3'-azido-3'-deoxythymidine, 2',3'-dideoxyguanosine and 3'-deoxythymidine. A novel RNA template for the evaluation of antiretroviral drugs". J Biol Chem. 266 (3): 1754–62. PMID 1703154. ↑ Rang H.P. ; Dale M.M. ; Ritter J.M. (1995). Pharmacology (3rd ed.). Pearson Professional Ltd. ISBN 0-443-05974-8. ↑ Balzarini J, Naesens L, Aquaro S, Knispel T, Perno C, De Clercq E, Meier C (1 December 1999). "Intracellular metabolism of CycloSaligenyl 3'-azido-2', 3'-dideoxythymidine monophosphate, a prodrug of 3'-azido-2', 3'-dideoxythymidine (zidovudine)". Mol Pharmacol. 56 (6): 1354–61. PMID 10570065. ↑ Dyer I, Low JN, Tollin P, Wilson HR, Howie RA (April 1988). "Structure of 3'-azido-3'-deoxythymidine, AZT". Acta Crystallogr C. 44 (4): 767–9. doi:10.1107/S0108270188000368. PMID 3271074. ↑ Camerman A, Mastropaolo D, Camerman N (1987). "Azidothymidine: crystal structure and possible functional role of the azido group". Proc Natl Acad Sci. 84 (23): 8239–8242. PMID 2446321. 1 2 3 Broder, S. (2009). "The development of antiretroviral therapy and its impact on the HIV-1/AIDS pandemic". Antiviral Research. 85 (1): 1–2. doi:10.1016/j.antiviral.2009.10.002. PMC 2815149 . PMID 20018391. ↑ Horwitz, JP; Chua J; Noel MJ (1964). "The monomesylates of 1-(2-deoxy-bd-lyxofuranosyl) thymines". Org. Chem. Ser. Monogr. 29 (7): 2076–9. doi:10.1021/jo01030a546. ↑ "A Failure Led to Drug Against AIDS". The New York Times. 1986-09-20. Retrieved 2010-06-30. ↑ Ostertag, W.; Roesler, G.; Krieg, C. J.; Kind, J.; Cole, T.; Crozier, T.; Gaedicke, G.; Steinheider, G.; Kluge, N.; Dube, S. (1974). "Induction of endogenous virus and of thymidine kinase by bromodeoxyuridine in cell cultures transformed by Friend virus". Proceedings of the National Academy of Sciences of the United States of America. 71 (12): 4980–4985. Bibcode:1974PNAS...71.4980O. doi:10.1073/pnas.71.12.4980. PMC 434023 . PMID 4531031. 1 2 Sneader, Walter (2006). Drug Discovery - A History. Wiley. pp. 260–261. ISBN 978-0-471-89980-8. ↑ Weiss, R (1993). "How does HIV cause AIDS?". Science. 260 (5112): 1273–9. doi:10.1126/science.8493571. PMID 8493571. ↑ Douek, D; Roederer, M; Koup, R (2009). "Emerging Concepts in the Immunopathogenesis of AIDS". Annu. Rev. Med. 60: 471–84. doi:10.1146/annurev.med.60.041807.123549. ↑ Yarchoan R, Klecker RW, Weinhold KJ, Markham PD, Lyerly HK, Durack DT, Gelmann E, Lehrman SN, Blum RM, Barry DW (1986). "Administration of 3'-azido-3'-deoxythymidine, an inhibitor of HTLV-III/LAV replication, to patients with AIDS or AIDS-related complex". Lancet. 1 (8481): 575–80. doi:10.1016/s0140-6736(86)92808-4. PMID 2869302. ↑ Fischl MA, Richman DD, Grieco MH, Gottlieb MS, Volberding PA, Laskin OL, Leedom JM, Groopman JE, Mildvan D (1987). "The efficacy of azidothymidine (AZT) in the treatment of patients with AIDS and AIDS-related complex. A double-blind, placebo-controlled trial". N Engl J Med. 317 (4): 185–91. doi:10.1056/NEJM198707233170401. PMID 3299089. ↑ Cimons, Marlene (21 March 1987). "U.S. Approves Sale of AZT to AIDS Patients". Los Angeles Times. p. 1. ↑ Greenhouse, Linda (January 17, 1996). "Supreme Court Roundup;Justices Reject Challenge Of Patent for AIDS Drug". The New York Times. ↑ Armstrong, M; Murphy GM, Jr (26 April 2012). "Inventorship and ownership considerations and pitfalls with collaborative research: patent highlight.". ACS medicinal chemistry letters. 3 (5): 349–51. PMC 4025834 . PMID 24900477. 1 2 Meland, Marius (May 3, 2004). "Judge Denies Request To Dismiss Patent Challenge Vs. Glaxo's AZT - Law360". Law360. ↑ "HIV/AIDS History of Approvals - HIV/AIDS Historical Time Line 2000 - 2010". FDA. August 8, 2014.